As fashion week kicks off in New York this week with designers showing their spring 2008 collections, there's a strong 1960s vibe showing up on runways and even in some of the accessory collections being presented in showrooms around town. The designer Elie Tahari yesterday presented his bohemian-inspired collection of bright silk dresses and printed gypsy tops in a bank lobby. His wife and collaborator, Rory, pointed out an embroidered earth-toned top and skirt that she said was inspired by Yves Saint Laurent's work in the early 1970s. Hedging my bets on what the most important look for spring might be, I would put money on the sophistication and ethnic inspirations of YSL. 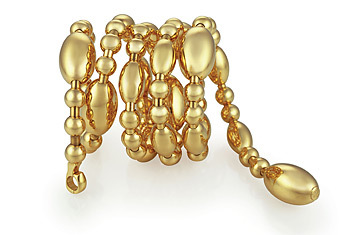 Jewelry designer Amedeo Scognamiglio of Faraone Mennella says the current interest in the late 1960s and early 1970s may come from a desire for "old time" luxury. "The sixties were the years when fashion was also synonymous with luxury, as opposed to today's too flexible sense of style," he said. "We are trying to create something solid, with a sense of history." Their "Bolle" necklace, for example, was inspired by the solid and bold look of 1960s Italian pop icon Raffaella Carra. Off the runways the big trend is to talk about copyright laws and whether or not fashion designers should be protected legally by intellectual property rights the way software and art is in America. A bill proposing to extend copyright protection to fashion was introduced in the Senate last month and designers like Anna Sui are suing companies like Forever 21 for stealing their ideas. Piracy in fashion is nothing new, of course. In 1994 Yves Saint Laurent sued Ralph Lauren for copying a black tuxedo dress and won $395,090 in a French court. Today, the speed at which runway photos reach the internet, coupled with the manufacturing prowess of mass market companies specializing in inexpensive trendy clothing only exacerbates the problem. But is it a problem? That's the debate. Of course designers want to own their ideas, and reap the commercial rewards for their work. But don't many designers get a lot of their ideas  whether it be a handbag, a shoe, a print, or an entire garment  from vintage stores anyway? The question of who had an idea first (did YSL actually invent the tuxedo?) only complicates the matter. Who owns 1960s-style geometric prints? The late great decorator David Hicks? Or Tory Burch? A logo is one thing, and the shape of a specific garment perhaps could also be protected, but it's hard to prove where ideas come from and, besides, divining the origins of any inspiration has become so much a part of the fashion game.